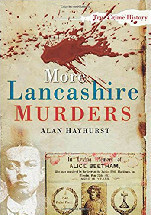 The chilling follow-up to Lancashire Murders, well-illustrated in black & white..
Alan Hayhurst is a retired bank manager. He has spent more than 40 years as a crime historian and has appeared as a guest on both Sky’s History Channel and Channel 4. He is the author of numerous true crime titles, including Lancashire Murders, Staffordshire Murders,Cheshire Murders, and Greater Manchester Murders….